This next week will determine the moral heart of our beaut country. The election on Tuesday will be a referendum or a clear denunciation of the moral leadership of this President and Congress. I am a registered Republican that has always voted for who I believe is best to lead our country regardless of party affiliation. I have been frankly shocked and disturbed by the actions of the President and his supporters in Congress. I believe in less regulation but not at the expense of our planet and children’s future. I believe in fiscal conservatism but we are now reaching a trillion dollar deficit. Tax cuts should have been for the middle class first. Corporations did not need a 21% rate. They would have been fine with a 25% rate. Then we could have kept our State and local tax deductions along with our Employee Business Expense deductions. We are in for a rude awakening when we file our taxes next year. Mitch McConnell announced last week that cuts must be made to entitlements to make up for the lost hundreds of billions of corporate tax revenues. That means Social Security, Medicare, Medicaid and other safety nets will be cut. This is a morally bankrupt President that has filled his administration with indicted and convicted individuals, pays off mistresses, turns a blind eye to the murdering of a journalist for greed (you can tell the Saudi’s to remove the prince), complains about how a MAGA bomber affects his campaign, supports white nationalists and declared himself a Nationalist (wink-wink) and is in a constant state of acting like a spoiled 10- year-old boy that has no sense of empathy. This man needs to have cold water thrown in his face to wake home up to the reality that the majority of Americans are exhausted with his personal attacks and praising of despots and our enemies. The time has come to make a moral choice. We can force a correction upon him and hope that he will try to listen to all sides and find reasonable compromise. We have the power. I plead with you all to take a step back and look at our current state of our Union and search for your better angels. God bless America! We need a traffic light and Florence and Orizaba. We have had too many accidents occur here. We also have too many cars exiting here since Century 21 A Better Service opened up. Our streets are filled with overflow from their parking lot. We can never park our cars in front of our home. The chiropractor at the other corner does not have enough parking either. We can not exit due to heavy traffic on Florence. Even the keep clear signs are ignored and accidents occur almost every other week. I have lived here since 1976 and the area has changed drastically. While I respect and enjoy reading the Patriot, the article on plans for American Legion property on Garfield Avenue was misleading. For one, we don't call this facility a shelter and I wish Downey City Council Council would stop leaping on this because of one sign out of hundreds. I am sure you must play nice with your own council, including Mayor Pro Tem Rick Rodriguez, but it would have been reassuring to see the other side of the equation where folks from South Gate and Downey could have been heard also. The facts are that nothing is written yet on what will be placed at the Legion property. Now Downey and LA County have evicted our American Legion (as of Nov. 17, 2018), a staple of our neighborhood for 70 years and whom LA County and Downey have never bothered to help with the taxes, fix their roof or help with any horticulture on the land. Now we come to the proverbial "it is for veterans” — come-on. Not true. This is where all these non-profits (taxpayer money) come out of the walls calling everything "for vets". In 2016, a popular homeless housing non-profit came to South Gate saying they were building permanent homeless housing for veterans. After many meetings the answers to our questions were, “we are hoping for 38 veterans and the rest will be homeless and chronic homeless,” and because these units are permanent homeless housing, the resident can do anything in it that we can do in our homes. One question was can they do drinking and drugs and the answer was yes, this is their home. Another question was must the residents attend the self help programs and the answer was a resounding no. "We cannot force people to attend career or other counseling." When questioned if dishonorably discharged vets were allowed, it was said at one meeting that yes, since a lot of them had PTSD. Does that mean if they were in for a month and decided they didn't like it they had PTSD? Will there be a curfew? This property in the city of Downey is right next to thousands of South Gate families and two schools but almost a 1/2 mile away from Downey council members’ constituents. Will Rick Rodriguez, co-founder of the non profit Living Tree Foundation and on the Board of Courage Forward, have a piece of this pie? Fame? Fortune? Both? We don't want homeless facilities every two blocks and I don't think the voters of Measure H and other voter-approved funds knew how badly our tax dollars were going to be mismanaged. Again today they appear in my mailbox: fear mongering political fliers in dark red and black, with words like #hypocrite and #sinverguenza in thick bold type and “Fired” stamped across a woman’s face. This is what passes for political discourse these days, mailed by some shadowy group “not authorized by a candidate” but definitely opposing Cristina Garcia. Who is sending these dark scary ads? The return address is from San Rafael, a long way from our 58th Assembly District that Garcia represents. The group paying for these ads is a shadowy group called “Working Californians Against Corruption,” based in San Francisco. This group believes that slinging mud and promoting fear, rather than discussing positions and accomplishments, is the way to our vote. Garcia already gracefully endured one politically motivated hit-job by her opponents this year. She has a long list of accomplishments in public service, including important legislation to clean up the lead contamination from the nearby Exide battery plant, efforts to combat cyber-bullying, and support for gender equality in school services. Her campaign ads reflect her dedication to service. They are respectful, up-beat, intelligent and informative. Sadly, little has been heard this year directly from the opposing candidate. Because of Garcia’s hard work for the people of her district and all of California, and because she has refused to engage in another dive into the mud that characterizes so much of our politics today, she will have my vote this Tuesday, Nov. 6. There is a new movie called “First Man” in which Ryan Gosling portrays Neil Armstrong. The film’s trailer shows Armstrong standing on the moon with a pure 100% black outer space background of not one single star. There should be thousands of stars behind him. I am a moderate voter that has voted for both Democrats and Republicans in the past. The state assembly seat for District 58 is up for election. Republican Mike Simpfenderfer is challenging incumbent Democrat Cristina Garcia for the seat. I have been very disheartened by the accusations of terrible behavior and improper conduct against Garcia, and was definitely looking to vote for an alternative to her. Before I could cast a vote for him, I wanted some straight talk from Simpfenderfer. He frequently says that we deserve better than Garcia (I agree) and he goes on to speak of the need for a respectful and proper work environment that has been apparently lacking on the part of Garcia. So, I asked him via his Facebook page why is it okay to verbally support Donald Trump and the absolutely appalling, uncivilized and disrespectful way he conducts himself, but Cristina Garcia has to go for her poor behavior. He read my question, but never gave me answer. Well, I agree with him that we deserve better, but the fact is we deserve better than Garcia and Simpfenderfer, This man professes to be a change, yet refuses to even answer a simple question from a constituent he claims to wish to represent. He is just another partisan hypocrite. As a voter with a conscience, I can not vote for either of these candidates. I hope the next time this seat is up for a vote, we have a decent candidate..or heaven forbid, two decent candidates that have a moral compass and are willing to engage and address concerns by voters. Sadly, smear tactics have become the new norm in local politics, a sinister form of character assassination aimed at disparaging our community leaders. A recent ad, wrought with a litany of lies about Cristina Garcia, our 58th district assembly representative, aims to derail her successive run for the 58th Assembly District. This disparaging ad, seemingly retaliatory in nature, presumes voters will blindly jump on the bandwagon to derail her chance of securing another term. However, when voters take the time to examine Ms. Garcia’s consistent record of advocacy on behalf of her constituents on issues of environmental justice, government transparency, women’s equity, health and education, youth empowerment and leadership and countless other family issues, then we must rise above the fray and bombardment of negative slanderous propaganda. Mean-spirited propaganda presumes the voting audience can be easily manipulated with falsehoods and unsubstantiated claims. However, it is evident, at least to voters we’ve consulted, that this smear campaign is about silencing us and relegating our community’s needs back to the margins. As conscientious voters, we won't be bullied by outside interests with deep pockets, who have an ax to grind. When voters consider Cristina’s commendable merits, then we voters rise above the fray to help Cristina continue the good fight. She is tough, highly effective and has credible support. Undeniably, she is passionate about the issues that matter and that most impact our communities. Your vote for Cristina Garcia is a step toward bold, responsive representation in the 58th Assembly District. On November 6, registered voters in the fourth district, which takes in the northeast part of Downey, will have the chance to elect a new council person to replace Fernando Vasquez, who is termed out after eight years in office. Downey Realtor and attorney Carie Uva, and emergency preparedness manager Claudia Frometa, are vying for the office. Both candidates have filed FPPC Form 460 with the Downey City Clerk reporting campaign contributions each received for the period of July 1 through Sept. 30. This letter addresses the donations to Ms. Frometa’s campaign, which are primarily from business interests. They include Best Buy Tire Center ($2,000), 4 Tires on Line ($2,000), Meghrig Stradley ($2,000), Champion Dodge ($2,000), CalMet Services ($2,000), Paramount Resource Recycling ($1,000), Marcar Real Estate ($1,000), RMI International ($650), Joseph’s Bar and Grill ($500) and Hernandez Carpet Buyers ($500). RMI International is the security business owned by current Downey Mayor Pro Tem Rick Rodriguez, who has endorsed Frometa. Outgoing Councilman Fernando Vasquez donated $2,000 left over from his 2014 campaign coffer. He has also endorsed Frometa. Other individual contributions of note include $500 from businessman Tony Abboud; and $500 from former City Councilman Mario Guerra. It takes money to successfully run for political office. Analyzing where that money comes from and the amount donated, can help to inform the voter, as it indicates the political interests of the candidate. Candidate Frometa appears to have the interests of business and her fellow politicians in mind. Remember the often quoted line from “All the President’s Men,” and “follow the money” before casting your vote in the fourth district council race. I would like to have some kind of an island installed on Studebaker Road between Cecilia Street and all the way to Florence Avenue. Lately there has been a lot of speeding and during the night weekends there's been young guys doing donuts in the middle of the street. I am just asking for safety in our streets and community. I hope the city takes action. Thank you Alex Dominguez for such an enlightening article on anxiety and depression. It was touching as well as educational. He shared such specific and personal symptoms that he has dealt with which, in my opinion, was courageous and selfless. In addition to the hotlines he mentioned for those in crisis, I want to recommend NAMI, National Alliance for Mental Illness. They have chapters in most communities and offer classes for family and friends that want to understand mental illness and better support a loved one. Thank you again for using your talent as a journalist to promote awareness on this very important issue. Voters in Downey should pay close attention to Proposition 3, a statewide water bond on the November ballot. California is completely dependent on a clean, safe, and reliable water supply. We live in a state prone to drought, wildfire, and floods and our water supply must be managed properly to meet these challenges. Our state’s economy and population continue to grow, as do the water needs of urban and rural communities, agricultural, and fish and wildlife. Proposition 3 also makes key investments in the mountain watersheds that are the source of our water. Fire is transforming our watersheds, degrading water quality and reducing available water supply. Proposition 3 devotes more than two billion dollars to restoring those landscape, and improving water quality and quantity. Funds will be used to reduce fire danger, and to repair fire-damaged watersheds. Proposition 3 will repair failing surface and underground water storage and conveyance facilities. It develops new water through such proven methods as recycling of wastewater for irrigation and industry, desalting, capture of stormwater and water conservation. Funding for fish and wildlife habitat protection and restoration is included as well. Hundreds of thousands of people in California don’t have a safe drinking water supply. Proposition 3 includes $750 million to help solve these problems. Proposition 3 will provide enough water to meet the water needs of more than three million families in California. Other programs in Proposition 3 include urban stream restoration; river parkways; and improvement of water quality in local rivers, streams and coastal waters. Proponents argue that Proposition 3 will prepare us for the next inevitable drought by improving the reliability of our local water supplies and giving local water providers the flexibility to deal with changing water supply conditions. California’s economy is booming and the state can easily afford Proposition 3. Our state’s credit rating has vastly improved since the recession, the state has a large budget surplus, and only a few bond acts have been presented to the voters in recent years, leaving room for the Proposition 3 water bond. Proposition 3 does not raise taxes. Proposition 3 does have opposition. The Sierra Club and Friends of the River oppose Proposition 3 because they believe Proposition 3 is too high a financial cost for the state’s general fund and will result in environmental damage. They are also opposed to direct appropriations for Central Valley water infrastructure, feeling that the state should play a greater role in the allocation of funding regionally and are opposed to subsidizing agriculture. On the other side, environmental groups supporting Proposition 3 include the National Wildlife Federation, Nature Conservancy, Audubon California, Planning and Conservation League, Ducks Unlimited, Save the Bay, California Trout, and California Waterfowl Association. These groups work on the ground to improve the quality of life in our local community. Senator Dianne Feinstein and GOP candidate for Governor John Cox support Proposition 3. Proposition 3 is endorsed by Downey’s water district, the Central Basin Municipal Water District, California Greenworks, Friends of the Los Angeles River, Metropolitan Water District of Southern California, Mujeres de la Tierra, CLEAN South Bay, Climate Resolve, Water Replenishment District of Southern California, Tree People, Strategic Action for a Just Economy, MOVE LA, West Basin Municipal Water District, Biz Fed LA County, and The Los Angeles Area Chamber of Commerce. Proposition 3 is a chance to improve the reliability of Downey’s water supply, and enjoy higher quality water in our rivers, streams and ocean, but does have opposition. Learn more at www.waterbond.org. As we celebrated National Voter Registration Day yesterday (Sept. 25) I wanted to take a moment to recognize this as an opportunity for everyone, and specifically my fellow Millennials. Though we may see this as another silly thing to celebrate, like National One Hit Wonder Day, or National Donut Day (actually one of my favorite holidays to celebrate), this reminder shouldn’t be taken lightly. Millennials, especially Latinx Millennials, are slowly becoming a huge force to be reckoned with, and I believe representatives will be lobbying and campaigning for our votes in the next decade. However, I don’t think we should wait; I think people should be asking for our votes now. Millennials will become the next big voting block in no time, but why wait. People (our older generations) give Millennials a bad rap and say we don’t go out and vote, I say we change that. Let’s shape the world we want for the future today. If you haven’t registered to vote for the next election, please do. October 22 is the deadline to register to vote for the November 2018 election. My fellow Millennials, I urge you to register, and if you have, that’s great, encourage your peers to register as well. Lastly, registration is only half the battle; the other half is going out and voting! So please vote and lets make our voices heard this coming election. Each year from September 15 to October 15, the United States reflects upon and celebrates the tremendous contributions of Hispanic-Americans in building our great nation. 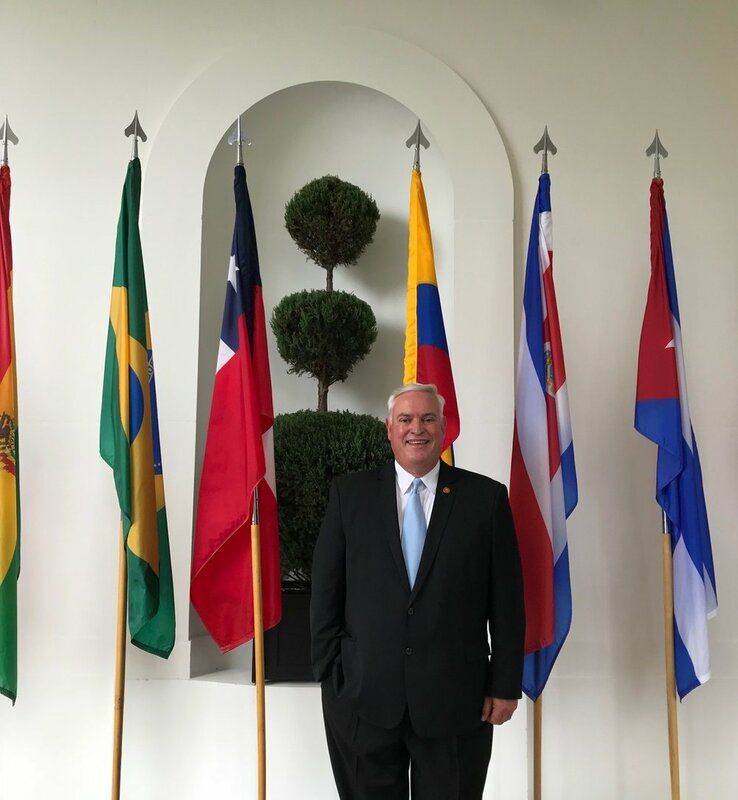 Last week I attended a reception at the White House in honor of that celebration, Hispanic Heritage Month. It was personally an exciting visit and self-realization of what opportunities our country stands for. 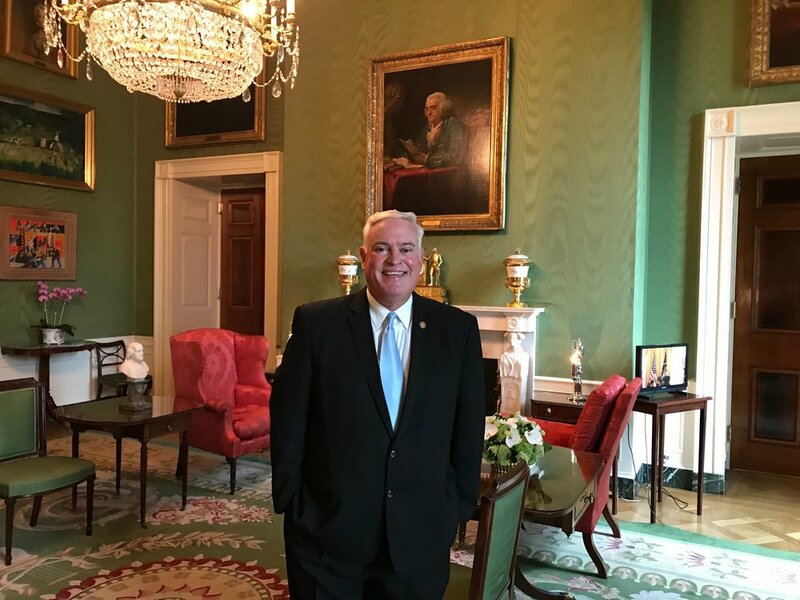 Coming to America as a little boy refugee to today, exploring the rooms in the White House made me proud of who we are as a country. Standing with the Vice President, cabinet secretaries, senators, ambassadors, and yes, the President, made me realize how far we have come as a nation. It made me proud to be a Latino, a Hispanic-American. Latinos remain a powerhouse in terms of the growing number of businesses owned and operated. Political influence and as a consumer base. The shaping of America can be attributed, in part, to the influence and contributions made by Latinos. As Hispanos, Hispanics, Latinos, LatinX, Chicano or Tejanos, our common backgrounds vested in Latin American heritage brings unity as a group targeted by marketers, politicians and academia. When we talk numbers, Latinos are again leaders in contributing to local and national economies with over 2 trillion dollars of purchasing power nationally, and more than $215 billion in tax revenues (circa 2015). As entrepreneurs, Latinos owned more than 20 percent of all transportation and warehouse businesses in the United States as of 2012 and a growing number of the country’s construction firms. Latino business created nearly 3 million jobs to the U.S. workforce annually and that number continues to grow. Politically, it is estimated that between 2015 and 2020, 5.7 million newly eligible Latinos voters can take part in local and national elections. Unfortunately the action of voting versus being eligible has not always been consistent. The Latino influence doesn’t end there. Homeownership amongst Latinos continues to rise with 20 percent) 17 million) of all homes owned in the country and an estimated 6 million more to be purchased by 2024. This trend will continue as Latinos advance in high learning earning post-graduate degrees – where Latinas are also leading the charge in obtaining Master and Doctorate degrees. Let us not forget Latinos represent nearly 20 percent of all active military personnel - 242,907 of the 1.29 million enlisted. We should honor their patriotism and devotion to serve our country. And two of our most famous astronauts are Ellen Ochoa, first Latina in space, and Jose Hernandez, both working with NASA on space experiments and exploration. There are also 1.5 million Hispanic veterans in our country that have served to protect the freedoms we enjoy. More than 40 Hispanic-American soldiers have been recipients of the Medal of Honor, our countries highest military decoration. More than 20,000 Hispanics fought on both sides in the U.S. Civil War. Celebrating our achievements in the cultural arena is also worth noting, whether it’s in music, food or gains in the artistic, sporting and entertainment industries, Latinos continue to pioneer innovation in every facet of our society. This Hispanic Heritage month (September 15 – October 15) let’s not just celebrate our culture, let’s get involved. Congratulate those who have built businesses by frequenting and purchasing from them, encourage our youth to study and go on to higher education by mentoring them and recognize the value our culture has and the enriching diversity we add to the American experiment of Democracy. As a proud Cuban-American, I take pleasure in being a part of the uniqueness that my Latino brothers and sisters bring and represent in the greater community and pray Latinos will remain bridge builders of the American dream. Every year – even 17 years later – there is something about this day that I absolutely dread. 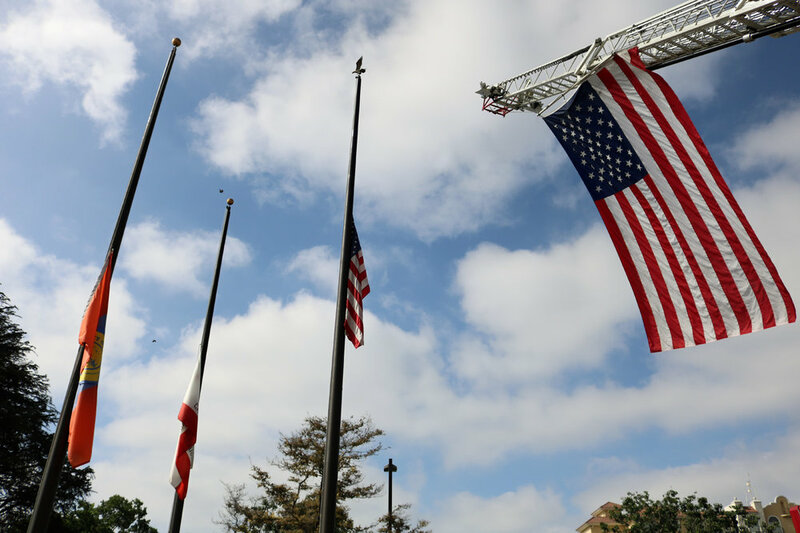 The date of Sept. 11 still weighs extremely heavy. I don’t know whether it’s the atmosphere, the memories, or just the general widespread, universal feeling of grief, but the day always feels like a slog through thick air. It’s a popular question to ask “Where were you when the Twin Towers were attacked?” Curious all these years later, I put out a feeler on one of Downey’s community Facebook groups. Jose Padilla had just wrapped up a 7 a.m. math class at Cerritos College and was heading to the computer lab when another student told him to look at what was happening in New York. What he found left him sad, broken, and in disbelief. Lupe Murillo saw the news on TV before going to work. She worked in a high rise by LACMA. Upon arriving she was turned away by the office manager, due to fear that their building might be targeted. Coco Rubio says she had woken up early before school and was in an online chat room when people started talking about the attacks. Those engaged in the chat got upset, thinking that an unfunny joke was being played on them. It wasn’t until she logged off and got to school that she realized the legitimacy of what had been posted. Elizabeth Aguirre saw it on TV that morning. Her oldest son was 8 at the time, and was traumatized enough that he refused to board a plane for years after. Ken Cook went from being a reservist to active duty almost overnight. My publisher, Jennifer DeKay, worked in an office that looked out over LAX at the time. All planes were mandatorily grounded after the attacks, and LAX took in a lot of that air traffic. She says it looked like a shopping mall on Black Friday. A very good friend of mine, Brittany Murphy, was a young child at home getting ready for school. Her aunt had been visiting from Texas and was supposed to catch a flight out at 11 a.m. Instead, she ended up staying an extra three weeks. Murphy’s daughter, Emma, is not far from the same age that Murphy was during the attack. I was an 8-year-old kid when I woke up to my mother’s and grandfather’s eyes glued to the tv screen. I remember being annoyed that I couldn’t watch my usual morning cartoons. I didn’t realize the severity of what we were witnessing until I got to school, where the somber feeling of each teacher and faculty member radiated and trickled down to the student population. When we were lined up that morning, we were addressed by our Principal Gary Hardy. I don’t remember what was said, but a moment of silence followed. September 11 attached everyone who witnessed and was affected by the attacks with a bond and a burden that we will all carry for the rest of our individual lives. With that bond and burden comes a responsibility that a generation before us also carried. Folks, it’s our turn; September 11 was our Pearl Harbor. For those of us that were older, it was a strike on our own turf, something that seemed unimaginable and unprecedented. For those of us who were younger, it was our first real experience with war. There is an entire generation now who were not there to witness what happened in New York. Teach them. Speak with them. Explain why and how this has created the world that they were born into. Let us never forget the day of September 11, 2001, and let us not let it become just another entry in a history textbook. The uber-liberal faction of State Legislature has come across another item of great importance to Californians – vegans in the prison system aren’t getting their greens. Yes, California Democrats have introduced a bill (Senate Bill 1138) to require prisons to offer inmates “plant-based meals” that are free of meat, dairy, fish, poultry or eggs. Last I checked, prison inmates are not who we the public turn to when we’re looking for living advice. I understand keeping a Kosher or halal diet, and there are already specialized foods available for inmates with certain health or medical needs. But veganism is not a religion or a medical issue. What’s next; inmates require a specific world cuisine? Prisoners already end up eating better than the almost 20 percent of Californians who struggle just to meet their basic needs. Adding a vegan menu to the prisons’ meal plan is costly, too. The California State Legislative analysis says the cost will be hundreds of thousands of dollars annually. There are far more urgent problems facing California than hiring vegan chefs for the digestive comfort of a few hardened criminals. Spending taxpayer money is all about priorities, and catering to finicky eaters in prison shouldn’t be high on that list. The Democrats in charge in Sacramento are spending too much time and money on ridiculous issues that impact a very few people and not enough time solving the truly urgent challenges facing this state, like affordability, the housing crisis, fixing the 911 system, stockpiling water for the next drought, wildfires, and so much more. Raul Riesgo is a public relations expert who has been featured on Spanish language news outlets Telemundo and Mundo Fox News discussing both political and Latino community issues. He has also been a news reporter for two Los Angeles area newspapers writing on variety of community and social topics. Congratulations on your coverage of the celebration of Dr. Mary Stauffer 101th birthday (The Downey Patriot, Aug. 30, 2018). She has set the bar very high for anyone who wants to emulate her. I regret that conflicting medical appointments precluded me from attending Mary's celebration at the Rotary Club and at the Assistance League. Given Mary's DNA, I am sure that Methuselah's record is in jeopardy and I look forward to celebrate with her her birthday in 2019.